Save processing time with an all-in-one dosimetry solution suitable for medical, nuclear, research, and other health physic applications. 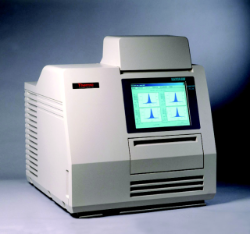 The Thermo Scientific™ Harshaw TLD™ Model 6600 Plus Automated Reader Instrument is a versatile medium capacity system for whole body, extremity, neutron and environmental monitoring. With no requirement for a separate extremity system, the Harshaw Model 6600 Plus reader offers significant labor and cost savings with enhanced dosimetry performance. Built-in automatic dosimeter calibration capability puts you in control of your system by letting you decide when to recalibrate. The Harshaw TLD Model 6600 Manual Reader provides versatile readout of TLD dosimeters. One dosimetry solution for whole body betas, photons and neutrons. Built-in automatic dosimeter calibration capability. No requirement for separate extremity measurement. Extensive built-in automatic QC tests and high MTBF. Flat-panel display and touch-screen operation. High sensitivity LiF material for extended monitoring periods. LiF has excellent energy response due to being near tissue equivalent, unlike Al2O3 or CaSO4. Includes: Thermo Scientific™ WinREMS™ User Software.